"Hyte, 2003.08.1581" by Timothy K. Perttula and Robert Z. Selden Jr.
DECORATION (INCLUDING MOTIF AND ELEMENTS WHEN APPARENT): The upper rim panel has a series of engraved arcs with three or four closely-spaced lines. There are excised triangles at the top of some of the engraved arcs. 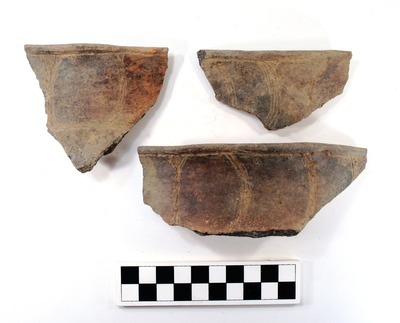 Poynor Engraved carinated bowl rim sherds, Hyte site.